You’re no longer “what” you eat, but “where” you eat from. Is that a dead apple you have in your hand? How much jet fuel did it cost to get it from New Zealand to your local grocery store? Local food is the new Organic, and you can now start switching to local food with the Locavore iPhone app. Google’s cafe at its headquarters serves only food that has been farmed within 150 miles, and guess what the cafe is called? Cafe 150. Local is growing and Farmer’s Markets are booming, localvore is the future of healthy conscious eating. So why should you eat local food anyway? The debate between Organic and Local has gone around for some time, and local is gaining a lot of ground. Buying organic food insures you it will be free of synthetic pesticides, fertilizers, but the produce will most likely not be grown in your state. Shipping food around the world has a few downsides. First, it creates pollution. Second your food will be aging and some say it will lose some of its nutritional values. Finally there’s the fact that you’re not supporting your local farmers. Buying local, will ensure your food is fresh and will support local farmers, although it may or may not be organic. This is something you have to decide for yourself, but overall going local is becoming as much if not more popular than organic every day. Especially after big stores like Walmart started to carry mass produced organic foods to cash in on the profits. So now that you’ve decided to join the local produce movement and be a locavore, you’ll need a way to keep tabs on what fruits and vegetables are in season, and who sells them in your hometown. There are a variety of sites that you can go to, but isn’t it nice to have an app for that? The fine folks at Locavore Network (Raif Barbaros) have created the perfect app. Using the Locavore app you can find produce that is currently in season, find farmers’ markets in your area, and brag about your latest local contribution. After all, guilting your Facebook friends into eating local might not be so bad. Locavor app automatically picks up your location using the iPhone GPS and shows you stuff currently in season and those coming in season soon. A handy pie chart shows how much time is left for each food this year. For example right now in California local grown peaches are in season, and have 6 months left. Tap any food item to see a map of the U.S. where the food is grown, and find local stores and markets that sell it. The app drops pins on a local Google based map and you can drag to zoom in and out of your surroundings. Tap any pin to get the seller’s details including location, contact info, and available produce. 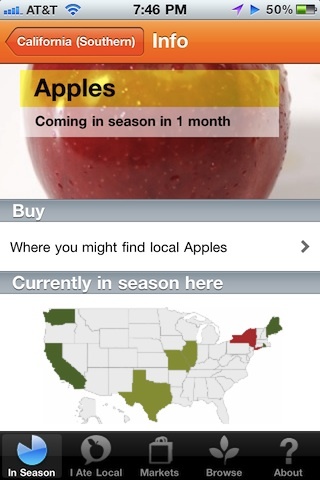 Using the currently in season state map you can also check out what things are locally available in other states. For example Southern California has no cherries in season locally right now, although Ohio, New Jersey, and Kentucky have it for another month, while Kentucky and Ontario will have fresh local grown cherries for another 2 months this year. Detail pages also have links to Wikipedia articles and a link to the Foodista site for available recipes using that fruit or vegetable. In my tests, unfortunately I never found any recipes however. Don’t see your food listed? 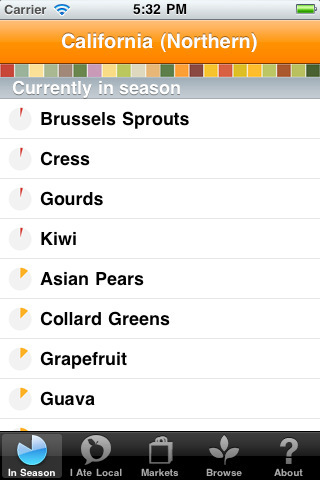 The Browse tab in the Locavore app lets you search for all fruits & vegetables by name. You can also browse by place, recipes this season or recipes coming soon. This is also useful for finding out where the non-local produce you’re eating is transported from. Finding local markets is provided using the Markets tab, where you will see a list of red or green pins. Red means the market is closed, and green means its open for business. Tap the + button to zoom into your location. Speaking of social, the I Ate Local tab is where you can show off your newly purchased local food to your Facebook buddies, and read what others in your vicinity are raving about. It would be nice if the app showed the markets in a list format as well for easier navigation. It would also be nice if the users of the app could post comments and rate the various markets in the app. Another feature to add to this app would be a favorite section, so you could bookmark and keep a tab on specific foods you are interested in. Finally, the app crashes quite often. I’m not sure exactly what causes the problem but I really hope the developers fix this issue soon. 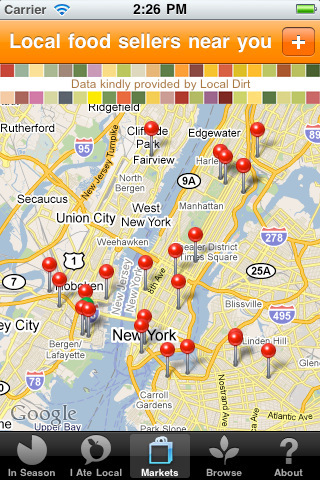 The app gets its farmers market data from Community Supported Agriculture (CSA) LocalHarvest.org, nrdc.org, and LocalDirt.com, so if you don’t see your local farmer’s market in the app, it is because they haven’t registered with those websites. For more local fruits, check out the neighborhoodfruit.com app, which I will review next. If you have an iPhone, you really have to grab this app. Androind and Palm owners are not supported right now by the Locavore app, so count your blessings and take advantage. AppSafari review of Locavore was written by Joe Seifi on June 2nd, 2011 and categorized under App Store, Food, Free, Health, Local, Shopping. Page viewed 4849 times, 3 so far today. Need help on using these apps? Please read the Help Page.